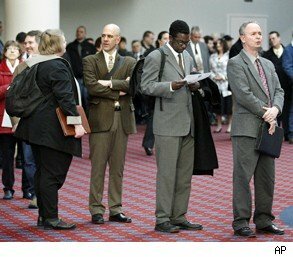 The nation's jobs picture got a weaker-than-expected shot in the arm Friday, following a report from the Labor Department that showed the economy created 120,000 jobs in March, well below analyst expectations of 200,000 newly created positions. As expected, the pace of job creation slowed in March, even as the country's overall unemployment rate fell to a three-year low of 8.2 percent, down from February's 8.3 percent. Within minutes of the jobs report's release, labor-market watchers labeled the latest report "disappointing" even as some noted that the overall recovery in employment remains on track. The weaker-than-anticipated jobs report could give expected Republican presidential nominee Gov. Mitt Romney ammunition is his bid to unseat President Barack Obama in this fall's general election, Washington Post columnist Greg Sargent noted. Among those calling the latest numbers disappointing, Sargent says that while the nation has had 24 months of consecutive private-sector job creations, the latest report "will help Romney make his latest case -- that Obama has failed to lead the recovery." Some labor market watchers were also concerned by statistics contained in Friday's report that showed the share of working-age Americans in the workforce slipped by a tenth of a percent in March to 63.8 percent. Noting that drop, Jim Pethokoukis, columnist and blogger for the American Enterprise Institute, a conservative think tank, tweeted shortly after the report was released: "If labor force participation rate had stayed steady from Feb., unemployment rate would be 8.4%." Gus Faucher, senior economist at PNC Financial Services, told the MarketPlace Morning Report radio program that the drop in the nation's unemployment rate to 8.2 percent was also a disappointment. "The unemployment rate fell because there were fewer people looking for work, not more getting jobs," he said. While the lower-than-anticipated number of jobs created last month failed to meet expectations, Faucher noted that since December, the nation has averaged more than 200,000 new jobs each month and he expects that job creation will once again resume at the previous pace. Among sectors with strong job growth, manufacturing remained a bright spot in the economy, adding 37,000 new jobs in March. That led David Shepardson, Washington bureau chief for The Detroit News, to note via Twitter that manufacturing has added "470,000 since it hit a low in January 2010." The overall economy has added 858,000 jobs since December -- the best four months of hiring in two years, The Associated Press reported. The trend of ongoing improvement in the labor market was bolstered Thursday. The Labor Department reported that initial claims for jobless benefits fell to a four-year low, while employment-services firm Challenger, Gray & Christmas said in its analysis that planned job cuts by employers dropped last month to their lowest level in 10 months. But Challenger's CEO cautioned that more large-scale cuts may come -- especially at the government level. Indeed, earlier this week Internet-search company Yahoo Inc. announced plans to cut 2,000 jobs, and retailer J.C. Penney Co. said Thursday that it plans to cut 900 jobs, including some 600 positions at its headquarters in Plano, Texas, as the company seeks to simplify its business.